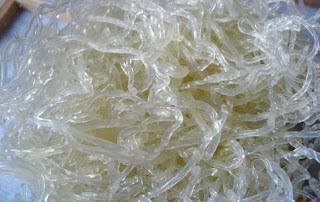 So, I have heard a lot about kelp noodles from my raw vegan contacts. What comes to mind? Well, frankly, some sort of rubbery unpleasant tasting stringy things-- that I would eat uncooked-- with some sort of raw tomato sauce. In the heat of the summer this might play out in an appetizing fantasy-- I could go harvesting in my little herb patches, grab a sunkissed tomato or two, eat on the balcony with a glimpse of the ocean through the trees. Anyhow, I did buy some said kelp noodles out of the sales cooler at our local raw restaurant/juice bar (and was amazed to find that they have expanded to offer hot vegetable soup and some other non-raw items on their menu.) They look more like your standard angelhair (white rice) noodles in the bag, but they are soft to the clutch. They were fairly pricey, but I generally rationalize that part of it if the food is nutritious (and trendy?). They lived in the fridge for a few weeks. I had thought that we would eat them over Christmas when my pasta-loving son was here, but he didn't stay long enough, or maybe I wasn't very well organized, or perhaps there was too many competing dishes on the holiday menu. In any case, there they were today, kind of calling out that they needed to be eaten. I removed them from the bag, these shiny, diaphanous strands. The package instructed that the noodles be soaked in water before using so I filled a bowl up with water. Rather wisely (I discovered) I used only half the package, because like all pasta, these noodles expand in size. There were a couple of Asian recipes on the back but not having wheat-free Tamari sauce, I decided to go more Mediterranean vegan. I stir-fried onions and cauliflower along with garlic, rosemary (I so love going out to clip rosemary from the shrub in the snowbank haha) and Celtic Sea Salt. I added water to steam them a bit, and then the remnants of a jar of organic spaghetti sauce. At the end I drained the water off the noodles and added them to the pan. I tried a noodle bit as I put it in-- a little crunchy. In a few minutes they were these long silky soft strands. I mixed everything together, gave it some twists of lemon, and ate. (My hubby ate too-- he gave them the double thumbs-up as well). How were the Kelp Noodles? As I said above, the noodles were silky soft (but not creepily so) and had a very nice mouth appeal... sort of like well-cooked brown rice spaghetti (which I also like a lot) but softer or maybe smoother with no teeth-fur after-effects. They blended very nicely with the other items, vegetables and spices, and I felt virtuous eating them because of all the sea minerals, (read: support to thyroid) that I know reside in them. I know that they are even healthier eaten in salad in their raw form and I will get to that... maybe in the summer. I believe that most pasta-holics would agree that they are a delightful alternative to wheat pasta, and I suspect that kids would love them.